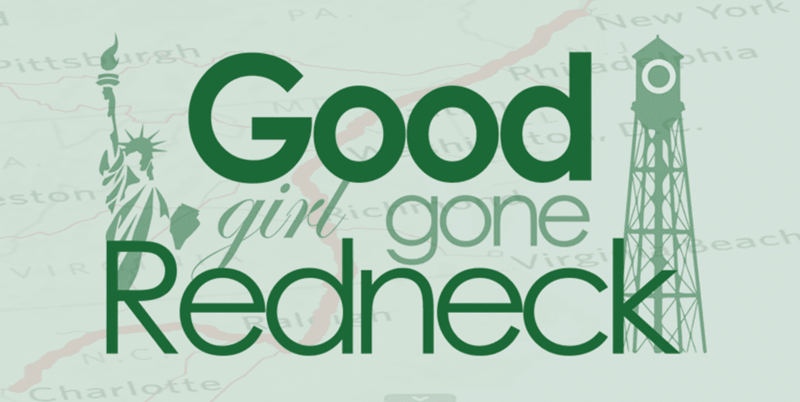 Good Girl Gone Redneck: May is Maternal Mental Health Awareness Month. This month is a very important one. You may have already seen me Facebooking up a storm about the local organization I volunteer with, Postpartum Education and Support, that helps support expectant and new mothers, and any moms experiencing postpartum mood related disorders. This kind of support is critical to women. 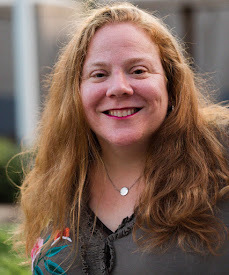 Postpartum Support International has coordinated a blog link-up to give women a space to share their thoughts, words and experiences with postpartum mood disorders. You can find the amazing posts over here: PSI 2013 Blog Hop. My goal while participating in this blog hop covers a few things. 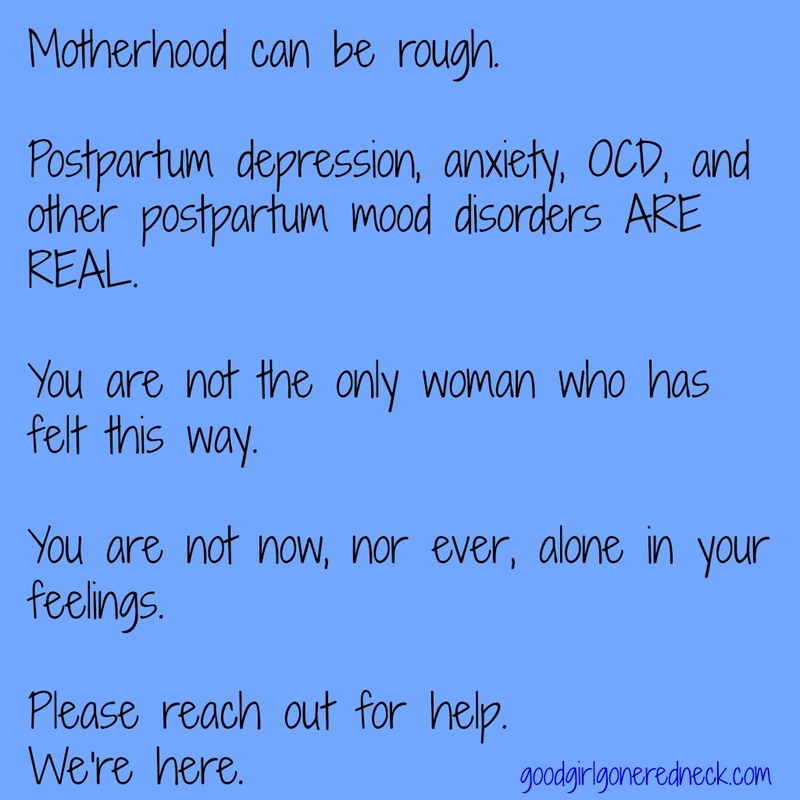 First, I want to remind people that postpartum mood disorders are REAL. They happen to real women, moms everywhere. If your wife, sister, friend, co-worker, acquaintance - if any of these women in your life are experiencing postpartum depression or anxiety symptoms, please don't ignore them. Reach out. Offer some support. Show them you care. Second, I want to remind those women experiencing these things that they are not alone. You - you over there - the one ready to tear out your hair if the baby doesn't stop her crying? You're NOT ALONE. And you, you in the bathroom with the water running so nobody hears you sob? You are NOT ALONE. 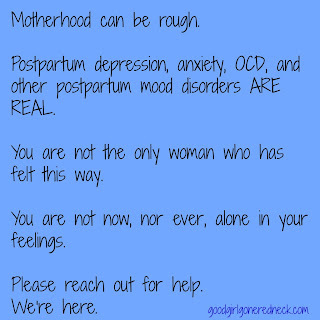 Postpartum mood disorders are absolutely REAL. And there IS HELP. Since there is a chance that I don't know you and you don't know me, you might not be able to get yourself to an organization like PES. Towards the end of this post you'll find some critical resource numbers for support. But before that I'd like to share some incredible communities and organizations and people who have helped me find so much love and support, even this many years beyond my own postpartum experience. * Postpartum Progress is a resource like few others. The information provided here, and the open and honest and raw way that Katherine discusses PPD, it's incredible. And if you haven't yet read my post after I met Katherine Stone for the first time, please do. * Lauren is amazing. She's created an army that's supportive beyond any expectations. My Postpartum Voice is her sacred space, where she talks about what's on her mind, but #PPDChat, what's that - you ask? Just head on over to The Twitter to find these amazing women. An army will be there in an instant if you need virtual support. * Ivy Shih Leung is someone I am proud and happy to call a friend. I met her through the virtual world and knew nothing about her. Not about her experience, not about her book. One Mom's Journey to Motherhood (that I am still reading, because it is sometimes hard to read about postpartum related things, I'll say honestly) is the real deal. Plus, Ivy herself is strong. She's got backbone and passion for what she feels is important. There are so many other amazing women out there who write about their postpartum experiences. 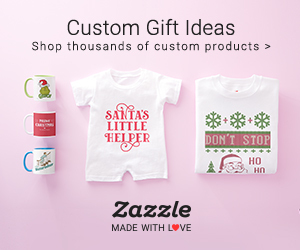 Would you like more reminders that you're not alone? Never alone. Meet Robin, the voice of Farewell Stranger. And head on over to James & Jax to remember how not alone you are. And go see my friend Yuz, of Not Just About Wee, who speaks to us from the other side of the world, and shares so much that we've all experienced. And powerhouse Susan, of Learned Happiness. And the beautiful Jen, of tranquilamama. A voice like no other, in more ways than one. Come on over to Mama's Comfort Camp, an environment created by the lovely Yael Saar that supports moms wayyy past the postpartum point. Look into joining our Facebook group where mamas get the comfort they need. Head on over to learn from Kate, of Sluiter Nation, because she will show you how to move forward. Go see Kim, she'll move you like you've never been moved, I'm sure. And the amazing Angie, who told me her story of postpartum depression in the moments we first met. I'll never forget her words, her voice, or her emotion. My friend Cristi will remind you that you're NOT A BAD MOM! And that's a reminder we all need now and then. She will also talk to you about so much more than postpartum mental health. And she shares things that you'll want to share with those you love. And my friend "Story" will explain that she, too, recognizes that sometimes motherhood IS hard. Multitasking Mumma has a voice that rings so true. Read her about Multitasking Mumma page and understand why she does not stay silent. And be sure to go and see the incredible Kathy Morelli at BirthTouch. Kathy invited me to participate in this amazing blog link-up. And I'm honored. I'm also reading her amazing book and I owe her a review very very soon. *Stay tuned! * The information and resources she offers are tremendous. So see? It's not just you. It's not just me. There are amazing women out there who are moving forward and battling or have battled postpartum depression, anxiety, OCD and more. We are strong and powerful and NEVER ALONE. Please reach out to someone if you need to talk. If you need some help. If you need a reminder. Personally I have a few posts here and there up about my own experience. Search PPA or PPD on my blog for more from me. More specifically, I share some moments when I recognized I was wading through antenatal anxiety. And other moments where I joked that I couldn't possibly have PPD, but must have had PPD-lite. I honestly didn't know there WAS such a thing as PPA. This was just a glimpse at my story. Don't hesitate to share yours. And if you're expecting, or a brand new mama, I wrote you a letter several years ago. I hope you'll take a minute or two to read it. And whether you do or you don't, here's a small reminder for moms everywhere. For more information on postpartum depression, symptoms and support, Band Back Together has a PPD resource page for you to review. If you find that you or someone you know needs immediate help, please contact the National Suicide Hotline at 1-800-273-TALK (8255). If you are looking for local pregnancy support or resources in your area, please call or email Postpartum Support International at 1-800-944-4PPD (4773) or support@postpartum.net. 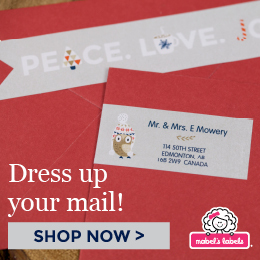 Very cool way to support moms! Definitely an important topic! Great to see it being talked about!! What an amazing resource list! So many suffer from this. Fabulous post!! Thank you for participating in the psi blog hop. I love the encouragement and all the links! This is such an important and useful post. Great job with your advocacy, Andrea. I admire that about you. And such lovely words for me. Aw. I was JUST thinking about doing a post for this blog hop too. I should get on that, yes? Great information and so many good links. Thanks for putting this together. Thank you for this message of hope. I am humbled that you included me on this list of voices to read. Thank you sweet friend. I love this message. "Please reach out for help. We're here". Your advocacy and kindness shines through in all your actions. Thank you for your message and links. Beautiful site!